My Bookish Identity Tag || I’m a Shadowhunter I guess? This tag explores readers’ possible identities in popular fictional universes. I was tagged by Kelly @Another Book in the Wall. What Dystopian/Fantastical World Would You Want to Live In? I think I’ve said this before somewhere, but I’ll say it again. 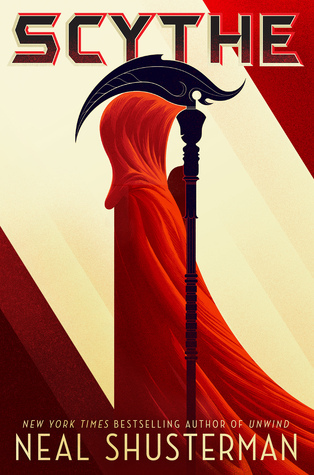 I would love to live in the world of Scythe by Neal Shusterman . . . except maybe sometime before book two begins because reasons . . .
Then again, in the fictional future of Scythe there is a good chance that if I’d been born anytime with in 150 years or so of book 2 happening I’d still be alive then. It’s a conundrum. For more of my thoughts on Scythe see my review. I’d never say no to being business partners with someone like Katness Everdeen. Then she could get me out of trouble and save my life if it ever needs saving. Hopefully it won’t. Also, I’d be popular by association. I got Athena. Not what I was expecting, but I’m okay with that. I got Shadowhunter. This is hilarious because, LOL, no. Which Hogwarts House Would You Be In [Harry Potter]? Erudite apparently. It gets a bad reputation in the series, but I’m going to take this quiz as a result going back to Erudite’s core value: seeking knowledge. And, an excuse to read all day? Yes, please. An Arctic hare. It would be awesome having an Arctic hare follow me everywhere. Unless I had to clean up after it. Then it would be not so awesome. . . I don’t think people in the Northern Lights series (which I know as The Golden Compass) had to do that? I just read the prequel a few weeks ago, so I should really know this. Want to be tagged? Let me know in the comments, and I’ll add your name to a list of people I’ve tagged in this post! Did you take these quizzes? What were your results? Any surprises?